This is a Fly – in / canoe out trip. For more information on fly in services, please contact this outfitter. Start your trip from Red Lake, Ontario with a fly-in to Valhalla Lake. Your vehicle can be shuttled to your pickup location or you can be picked up by a local outfitter. This trip takes you to the rarely used north-eastern section of Woodland Caribou Park. Starting at Valhalla Lake in the upper reaches of the Chukuni watershed you proceed west over the height of land (not that high really) and into the upper reaches of the Sabourin River watershed and then over yet another height of land to the upper reaches of the Bloodvein River watershed. You are literally in a corner of the park. Travel quietly here; caribou are in the area! A few years ago, a small wind event touched down and blowdown evidence remains. Traveling through Trough Lake you will reach Olive Lake. Here a few more patches of blowdown exist along with some beautiful sand beaches. From Olive Lake, begin your travels south towards the Bloodvein River. A series of six small lakes brings the scenery right up close. Joining the small lakes together is a series of six portages ranging between 200 and 700 meters in length. The first couple of trails are through an old 1995 burn. If it’s late July or August, I hope you like blueberries. Small lake paddling and portaging across a moss covered forest floor, brings you to Linge Lake where if I were you I would plan on setting up camp. The fishing is terrific with a variety of species to choose from. 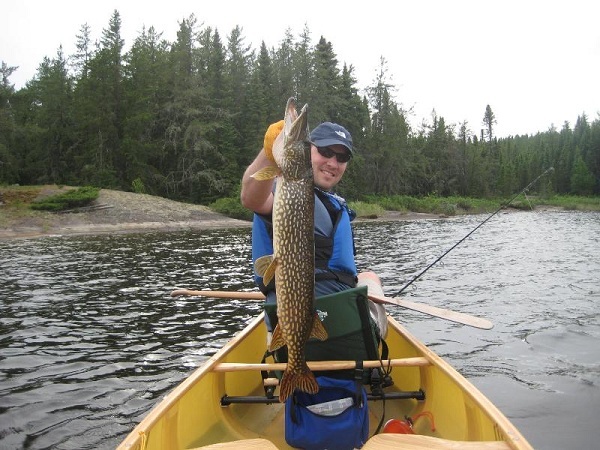 You can pull walleye, lake trout and northern pike from these clear waters. Sand beaches reveal the movements of local wildlife in the area and they make a luring welcome mat for a refreshing swim on a hot summer day. Now head west down Knox Creek toward one of Canada’s Heritage Rivers, the Bloodvein. Traveling between Linge and Knox Lakes you can dine on walleye and have a better than average chance of seeing moose along this productive waterway. This little system can get shallow during dry conditions and perhaps you will need to line your canoe in places. Young Lake is found part way and although it makes a short day, its and excellent walleye fishery and makes it a great place to stop and enjoy. As you leave Young Lake you will find patches of wild rice before entering Knox Creek again. Wild rice is especially noticeable in the later parts of summer. Say hello to the beaver and otters as you pass through this meandering passage and be prepared to hop over a number of beaver dams along the way. Your efforts will be rewarded once you reach the wide open waters of Knox Lake, another good lake to set up camp. You are on the Bloodvein River system now. Knox Lake is a moderate sized lake but because it is shallow, with a wind it can chop up pretty fast. Home to the Anishinabek and rich with history that goes back at least 8,000 years, more recently it was used by fur traders as a route from Lake Winnipeg to Red Lake to move goods. Whether you decide to stay here or move on towards your pick up location, the first portage out of Knox Lake will be the longest one you will encounter on your trip. At 1500 metres it is a gentle up and down over a predominantly hard surface and another place where blueberries are plentiful in July and August. The south end of the trail as it approaches the creek is mushy in spring and in high water conditions – but its not the end of the world. From here you have begun your last leg. Six portages, four lakes and a small pothole will bring you to Lund Lake and the parking area. You are now within an 80 kilometre drive of an ice cream, warm shower or a cold beer, whatever you prefer! 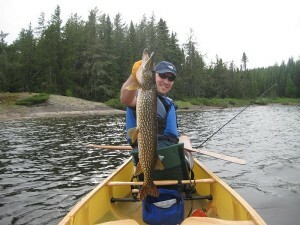 The lakes on this stretch are small and shallow with lots of islands and shoals. One more height of land in this stretch and the water starts to tumble down to Red Lake. A large forest fire in 1986 is still evident here as the forest is thick and lush. Trails continue beyond the entry point parking lot. If you choose to continue on this route instead of getting picked up at the parking area you will end up on Red Lake and can paddle right into town or get picked up by a pre-arranged water taxi. There are lots of choices.